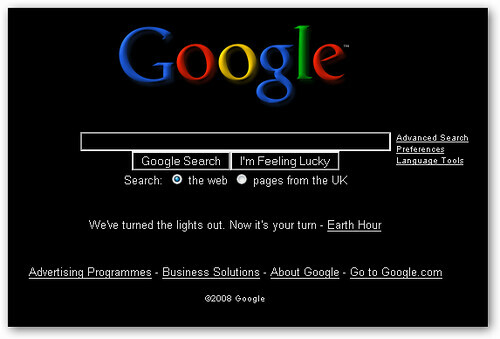 Google users who are in the UK might notice that the Google homepage has turned completely black today. Google is trying to draw attention to Earth Hour, which "uses the simple action of turning off the lights for one hour to deliver a powerful message about the need for action on global warming." Although technically a completely black webpage uses the same amount of power as a white webpage on a modern monitor, it does send a message of support for the effort to stop global warming. In fact, on March 29, 2008, 24 cities around the world will be participating in Earth Hour by turning off their lights for one hour starting at 8 p.m. When businesses and homes Sydney turned off their lights in 2007, there was a 10% reduction in energy consumption recorded. The idea of a black Google isn't new: Blackle was the first to implement the suggestion that a black Google homepage might actually save energy.